Colours of Hope held a Womens Fundraising Lunch for Rohingya Relief on 05 November 2017. 210 ladies attended the event. Speakers included Shabnam Mayet- Advocate and Spokesperson for Protect The Rohingya, Zeenat Adam- International Relations and member of Protect the Rohingya, Ludivine Houdet, Head of Resource Mobilisation of MSF Southern Africa and journalist and Co Director of Salaamedia- Azhar Vadi. Following the most recent rounds of violence on the historically persecuted Rohingya minority in Myanmar beginning August 25th, 2017, more than 650 000 refugees have fled across the border into Bangladesh bringing the number of Rohingya in the country close to a million. The newly displaced refugees are living in very poor conditions in overcrowded camps in and around the Cox’s Bazar area in Southern Bangladesh. Most refugees left home with little but the clothes on their backs and have been eking out an existence in the camps living hand to mouth often solely reliant on humanitarian distributions. Al-Imdaad Foundation has been conducting projects for the benefit of the refugees since early September 2017 and the current project brought about by generous donations from your organisation is part of this initiative. The project aimed to provide nutrition for Rohingya refugees who have been struggling with hunger and inadequate food security. This project involved the purchase and slaughter of cows and the preparation of a fresh curried meal for Rohingya refugees in various camps and settlements around Cox’s Bazar in Bangladesh. The slaughtered cows were cooked in large pots on open flame fires as per the local method. The food was then packaged into individual serving containers and distributed along with freshly prepared rice. The meals were distributed hot to refugees from the Gundum (Camps 1, 2 and 3) and Balukhali Camp. 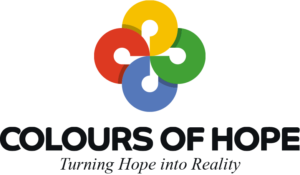 The generous contribution from Colours of Hope was able to provide fresh, hot, wholesome meals for approximately 3,202 individuals at a cost of R20.00 per meal. Many refugees have been struggling with basic nutrition so the opportunity to have a proper meal was greatly appreciated by the beneficiaries. Close to the Kutupalong makeshift camp in Cox’s Bazar district, MSF runs a clinic offering comprehensive basic and emergency healthcare, as well as inpatient and laboratory services to Rohingya refugees and the local community. On 5 December 2017, a Market Day Fundraiser for Rohingya Relief was held by COH and the support of Volunteer, Rubeena Jadwat of Newcastle, KZN. Proceeds of the event was donated to MSF on 27 December 2017. A total of R40,250.00 was donated to Mèdicins Sans Frontieres/MSF (Doctors Without Borders) and used towards the MSF Diphtheria Intervention. “The funds of Colours of Hope has been key to support MSF Diphtheria intervention. As of 21 December, MSF has seen more than 2000 suspected cases in its health facilities and the number continues to rise each day. The majority of patients are between 5 and 14 years old. By the end of January 2018, MSF teams treated more than 4,000 cases of diphtheria, the majority of patients were aged 5-14 years old”. I'd like to give more. Acceptance of any contribution, gift or grant is at the discretion of the Colours of Hope. The Colours of Hope will not accept any gift unless it can be used or expended consistently with the purpose and mission of the Colours of Hope. The Colours of Hope will refrain from providing advice about the tax or other treatment of gifts and will encourage donors to seek guidance from their own professional advisers to assist them in the process of making their donation. The Colours of Hope will accept donations of cash or publicly traded securities. Gifts of in-kind services will be accepted at the discretion of the Colours of Hope. Certain other gifts, real property, personal property, in-kind gifts, non-liquid securities, and contributions whose sources are not transparent or whose use is restricted in some manner, must be reviewed prior to acceptance due to the special obligations raised or liabilities they may pose for Colours of Hope. The Colours of Hope will provide acknowledgments to donors meeting tax requirements for property received by the charity as a gift. However, except for gifts of cash and publicly traded securities, no value shall be ascribed to any receipt or other form of substantiation of a gift received by Colours of Hope. The Colours of Hope will respect the intent of the donor relating to gifts for restricted purposes and those relating to the desire to remain anonymous. With respect to anonymous gifts, the Colours of Hope will restrict information about the donor to only those staff members with a need to know. The Colours of Hope will not compensate, whether through commissions, finders' fees, or other means, any third party for directing a gift or a donor to the Colours of Hope.